GDP per capita (PPP based) is gross domestic product converted to international dollars using Purchasing Power Parity (PPP) rates and divided by total population. 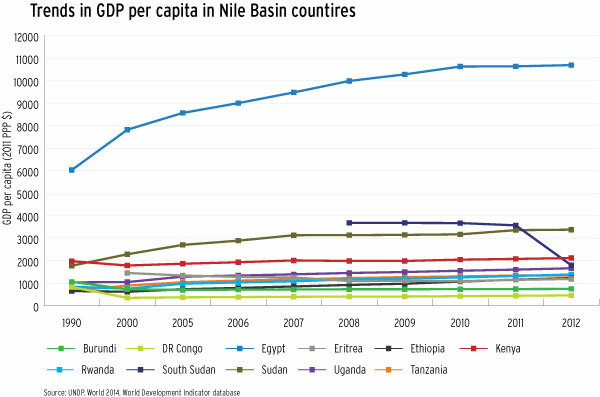 Among Nile Basin countries, Egypt has the highest GDP per capita, followed by Sudan. 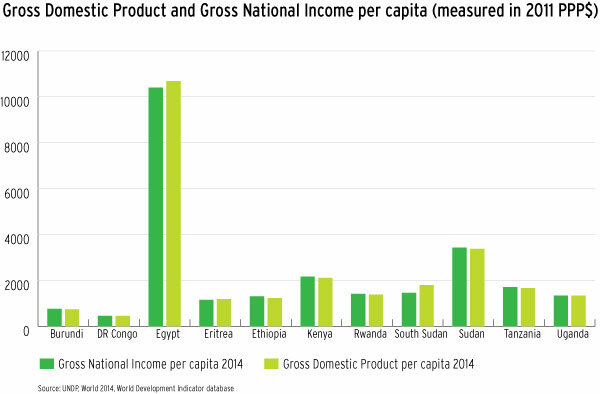 DR Congo and Burundi have the lowest Gross National Income (GNI) per capita is defined as the sum of value added by all producers who are residents in a nation, plus any product taxes (minus subsidies) not included in output, plus income received from abroad such as employee compensation and property income divided by the population. In 2014 Egypt and Sudan had the highest GNI per capita. The data show where production takes place in an economy. The distribution gives the percentage contribution of agriculture, industry, and services to total GDP. Agriculture includes farming, fishing, and forestry. Industry includes mining, manufacturing, energy production, and construction. Services cover government activities, communications, transportation, finance, and all other private economic activities that do not produce material goods. About 20% of Nile Partner states GDP is generated by agriculture. Agriculture still dominates the economy of many countries in the region. With structural transformation and industrialization, this contribution could change. Egypt has the highest per capita income (2011 PPP $ 2013) of US$ 10,733, almost 15 times larger than Burundi which has the lowest at US $747. Ethiopia had the highest real GDP growth rates at 8.5%.